I found Taylor, the brunette rocking those stunning curls, and Merissa, our lovely dirty blonde, on Instagram and immediately fell in love with them. Their entire feed is full of stunning images of national parks and their adventures together. Did I mention that they’re park rangers? Lesbihonest, they’re living their best lives and I can’t wait to share their story with you. How do you identify? I don’t generally think of myself as identifying as anything, but I’m comfortable with pansexual or referring to myself as gay. 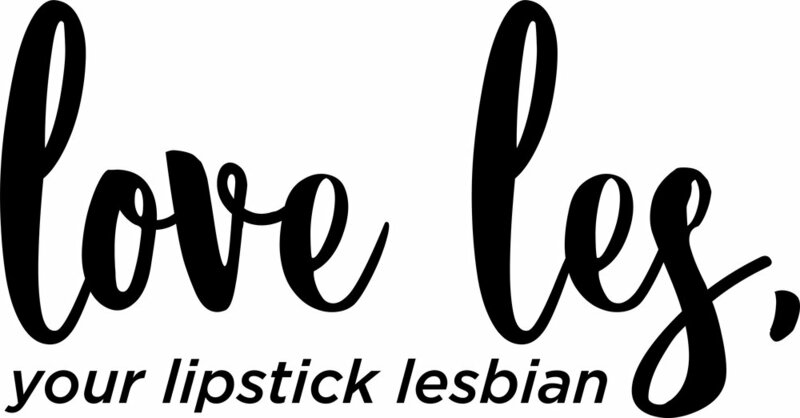 What are your favorite queer resources? I like the movie Kiss Me and the show Faking It. I also love watching or reading anything on Buzzfeed related to LGBTQ. What do you do? I’m a park ranger for the National Park Service in Kenai Fjords National Park. One day, I hope to obtain a PhD in botany to pursue a career in native plant restoration or conservation. What’s your life hashtag or couple hashtag? I think #lesbiadventurous perfectly describes us. What are you reading these days? If we’re being honest, I wish I read more for fun. We spend so much time moving and learning about new places that I usually find myself reading scientific resources about wherever we are living. So, right now I have my nose buried in a book about glaciology. What are your favorite queer resources? Kiss Me is the only truly good gay movie we've found! But we watch them all (even if they're terrible). What do you do? I’m an interpretive park ranger currently, but I would love to work more with plants or wildlife, maybe doing fieldwork or research. What are you reading these days? 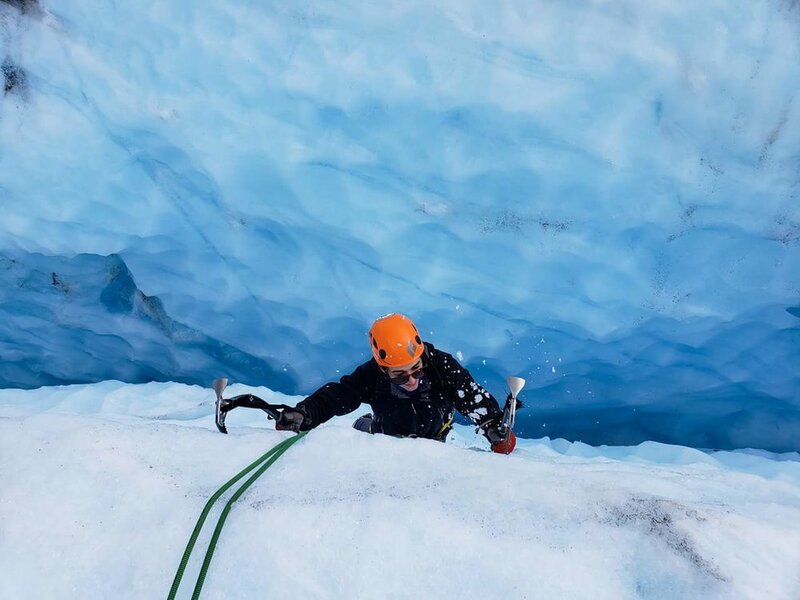 Study material about Kenai Fjords - there's always more to know! Tell me about being park rangers. T - We both work for the National Park Service, so we work for the government, but we work for the coolest part of the government! M - There are a lot of different types of rangers. We are interpretive park rangers, meaning that we’re educators who are facilitating connections between visitors and parks. What does your day usually look like? M - We work at Kenai Fjords National Parks. I’m what we call a “fjord ranger” or boat ranger. My main job is narrating 5, 6, and 7.5-hour boat tours with the private company that Kenai Fjords National Park partners with. Being out on the boats has been an incredible experience and every day is completely different. My first two boat tours there were 11-foot swells and everything was flying off of all of the tables! I’ve also had some incredible wildlife encounters, including breaching orca whales! When I’m not on the boats, I am either at the visitor center desk, or out at Exit Glacier leading walks or staffing the Nature Center desk. T - A typical workday is super hard to pin down to one thing. We have done many different things at different parks, and each park is different every day. Currently, I go to work around 8:00 a.m. and start my day at the visitor center in town. Then, a group of us carpool to Exit Glacier, where we open the Nature Center. I alternate between working the desk there and roving the trails for most of the day, but at some point I give a guided walk. I do my best to educate people about the area and about how climate change impacts the future of this area, then hopefully inspire them to do something about it! What inspired you to become park rangers? M - I’ve had an inherent passion for plants my entire life. At my preschool graduation when I was 4 years old I told everyone that I wanted to be a “flower grower” when I grew up - true story. Ironically, growing up in the Detroit area, I never traveled to National Parks, or went camping or hiking. Later on, after several years of biochemistry research, I realized I had to follow my passions for both plants and the outdoors. I started research jobs and found environmental educators. I remember thinking “That’s it. That’s what I need to do.” I ended up accepting an environmental education internship through the Student Conservation Association and the Forest Service in Oregon. Right away, I fell in love with the job. A year later I graduated from college and applied for 180 jobs, no exaggeration, with the National Park Service, Bureau of Land Management, and Forest Service. I was lucky enough to receive my first job as a park ranger in Yellowstone National Park in 2015, and I’ve been doing it ever since. It’s hard to imagine doing anything else. T - I think what inspired me to become a park ranger was a love of science and a passion for the outdoors. I never thought I would be doing something that requires a lot of public speaking, which still makes me nervous, but I love sharing science with people and showing them really special places. You ended up meeting each other at a park, right? M & T - Yes, we met in Yosemite National Park. It was Merissa’s second season as an interpretive park ranger and Taylor was volunteering. Our supervisor quickly learned that we had similar interests, and paired us up on projects together. We spent months working together on wildflower surveys, leading morning plant walks, and teaching visitors about bat research in the park. M - For me, yes! The minute I met Taylor I could not stop thinking about her. I could never explain what it was about her, but as we got to know each other more and more I knew that my gut was right. T - It took me a while to realize I had a crush on her because I wasn't fully aware that I liked girls at all. I do remember one day I was messaging her about a wildflower, and it brought a smile to my face and somehow I just knew! Merissa, did you ask Taylor out? M - Well, it wasn’t so much asking her out as it was drunkenly telling Taylor I had a “massive crush” on her. In my defense, living in a National Park makes it harder to ask someone on a proper date. Plus I was incredibly afraid to tell her how I felt, hence the alcohol involved in telling her, because I was nervous I would lose her as a friend and was convinced that she wasn’t gay. Dang girl. How did you respond, Taylor? T - I am a very shy person. So, when I realized I had feelings for Merissa, I basically locked them up inside. Then one night when we were hanging out with friends, and again, there was lots of alcohol involved, and Merissa told me she liked me. I honestly think my brain broke at that point because I was really convinced she was not gay and definitely did not like me. So, when she told me, I said nothing. I couldn't process it! T - After Merissa told me she liked me I tried for two weeks to bring it up again but couldn't! Finally on her birthday I got her some earrings and apologized for not saying anything. I told her that I felt the same way. Unfortunately, just two weeks after that I left to go back to school in Southern California. So, we weren't clearly defined as anything at that point, but it was pretty obvious we were going to try to make it work despite the distance. I want to say that it was a couple weeks later that I asked if I could call her my girlfriend officially. But we call our anniversary the night that she told me she liked me. M - So, we’ve been together 2(ish) years! T - It's gone by fast, but at the same time it feels like forever. Were either of you surprised when you started to fall for one another? M - No, but also yes. So, no I did not expect to find and fall in love with a girl, but yes, I had a feeling that if I were going to find my person, it would be in a National Park because of my interests and passions. Prior to Taylor, I had only dated men. In fairness, that was because I wasn’t comfortable with my sexuality and had no idea how to find other gay women. I assumed that there was no way I would ever meet or find a beautiful gay woman interested in the outdoors. T - Definitely not. I never really had any expectations for my love life. I think that I expected to meet someone eventually. Someone who loved the outdoors, hiking and traveling. I knew I couldn’t be with anyone who didn’t. Did you come out together? M - We both separately came out to our parents before coming out on Facebook on National Coming Out Day. I’ve always known that I liked both men and women, but I always told myself I wouldn’t tell my parents unless it was “necessary.” The minute I started dating Taylor, I knew how much she meant to me and that I was going to have to tell my family. My parents have always been fine with the LGBTQ community, but I knew it would be different because it was me. So, it wasn’t until after we were dating for a couple of months that I finally told them. My mom immediately said, “I love you,” but it took my dad a lot longer to come around. I’m incredibly fortunate that my parents vowed to love me, no matter what. As for coming out on Facebook, it was honestly very spontaneous. We realized that our families and close friends knew that we were officially together, but everyone else didn’t. It just so happened that day was National Coming Out Day, so we thought, what better time to come out? Taylor, what was coming out like for you? T - Coming out on Facebook on National Coming Out Day was honestly pretty spur of the moment. We had defined our relationship, we were happy, and I had already told my mom. So then when I saw it was National Coming Out Day, I decided I might as well tell my dad and brother. So, we Skyped earlier in the day and then later that same day I posted a coming out post on Facebook. My biggest fear in coming out was that I wasn't just coming out, it was that I had never been in a relationship at all, ever. So, my family and friends were getting hit with me being in a relationship as well as the news that I’m gay. My family took it well though and my friends were happy for me. That made it a lot easier to come out on social media. It was just kind of an announcement like, “By the way I'm gay.” More recently I have run into some family members who have heard/seen through facebook and are a little weird about it, but the only thing that matters to me is that my close family supports me, and that I am happy. What are some of the places you two have traveled together? M - We have spent a lot of time in the US traveling to all sorts of National Parks and natural areas. I think my favorite has been Grand Staircase-Escalante National Monument. It has some of the coolest and craziest landscapes I’ve ever seen. We also had an amazing time exploring many different slot canyons! T - We have been so many places together! We started in Yosemite, backpacking together every weekend. We explored so many trails in the park and outside the park in the Eastern Sierras of California. This is still my favorite place that we have been, for so many reasons - it just feels like home! We’ve traveled to Joshua Tree, Zion, Capitol Reef, Arches, Canyonlands, Monument Valley, Great Basin, Death Valley, Banff and Jasper, and so much more! We have yet to travel abroad together, but we have lots of paces on our list! M - Iceland, Greenland, and New Zealand. I have an affinity for the Fjords. T - My top three would be Iceland, Australia, and Peru, but it’s really hard to chose! I know you document your travels on instagram. Tell me more about that. M&T - We both love taking pictures! We’re pretty bad at taking pictures of us together. We’re too busy taking pictures of the landscape or wildflowers on the ground. We started our Instagram to share some of our adventures and hopefully inspire others to get outside and explore as well! M - In the near future, I would love to put down roots, get a cute house, and adopt a puppy. I also still can’t wait to travel abroad with Taylor. We’ve been dreaming about volunteering at the Tolga Bat Hospital in Australia! T - We don't have any solid plans for the future due to the nature of our jobs but we do have long-term goals. We really do want a cute house, with a garden, and one, or two dogs - one Golden Retriever and one Samoyed. What coming out advice would you leave our readers with? M - Take your time. Don’t come out because you feel like you have to – come out when you’re ready and the time is right for you. T - Don’t feel like you need to define yourself before you're ready. I didn't feel like there was any reason to come out as anything until I was in a relationship. And even though I didn't really have a long period of time between knowing I was gay and coming out, it is still very freeing to come out!